What drove me to switch to Android and the Samsung Galaxy S III after five happy years with iPhones? I covered two of the reasons in Part One and I’ll spill the other two major reasons here in Part Two. To recap: I’m avoiding the nitpicky little details of iOS versus Android. Instead, I’m focusing on the four broad signature elements of Android 4.1 that I found so enticing and useful over weeks of testing that making the move seemed like a no-brainer. One thing strikes me about this list: each item is something positive about Android, instead of something negative about the iPhone. That’s often a sign that a decision is the correct one. If you’re moving toward something, it means you know what you want and you think this other thing will deliver it to you. If you’re moving away from something, you’re headed towards… what, exactly? You don’t know where you’re going but you know it must be better than the situation you’re fleeing from. Are you moving away, or moving toward? Life is a much less nervous undertaking when you travel with a destination in mind. It also underscores a point I swatted at yesterday. What’s wrong with the iPhone 5 and iOS 6? Nothing. It’s just no longer the right phone for me. Well. I shall now take off the red cardigan and the navy blue Keds of Mr. Rogers and climb back into the noble armor of the hardened tech columnist. Yesterday I talked about the keyboard and the truly larger screen on the Samsung Galaxy S III. Here are the other two features of Android that got me to switch. In Android, apps hand off to one another. An iOS, they struggle to escape their sandboxes. Getting stuff done with a phone is muchly about moving information between multiple apps. That characteristic is peculiar to phones. Most of the things I do with my phone involve using one app to obtain a scrap of data, and then pushing it into another app to work on it a bit, and then sending or sharing it using a third app. Even when I’m using my iPad, I’m spending most of my time soaking in one app at a time. Almost anything I do that involves one app working with another app is much, much easier on an Android device than on an iPhone, thanks to a deep-rooted mechanism for interapp collaboration. I’m about to drive an hour to my aunt’s house. A device-wide search for her name surfaces her Contacts card. With one tap, I can send the address to any app that works with addresses, such as Waze or Twist or Maps, and begin driving. I do not want to contemplate that phrase. Ever. Oh, well. When Apple demonstrated iOS 5’s system-wide ability to Tweet a photo or a link, it was presented as some sort of breakthrough, on a par with the first observation of the Higgs boson. Twitter, fine. Facebook? I don’t use it. Anyway, these single-task hardwired solutions aren’t what I need. Some iOS apps can pass information to some other apps, either through custom URL schemes, or because they were designed to work together from the get-go. There are also ways to save a webpage to Evernote, or Instapaper, or Pocket, but you need to download and install the right bookmarklet in the right way. For a company that ships a phone with a clean, simplified keyboard that lacks any kind of feature enhancements, that’s a needlessly complex solution, isn’t it? In Android? Share > Evernote. Done. My iPhone would be so much easier to use, so much more valuable, and so much less clumsy to me if its apps could work together instead of working in strict isolation. I don’t outright hate how iOS firewalls data between apps, but every time I want to move a bit of data outside of its original sandbox, it’s a pain point. “Copy > App Switcher > Paste” is just sooooo 1988, you know? Android has a consistent core philosophy that I find instinctively compelling: why wouldn’t a phone give its sole user a vote on how their device works? And because Android mostly hides its customization features where they won’t be discovered without a deliberate search, these options are unlikely to confuse anyone. Presenting a consistent and logical experience across the device for the majority of all users is important, particularly when you think about the large percentage of technophobic users and the added percentage of users who don’t ever want to be bothered. I insist that customization benefits the user. Or at least it does if that user is like me. The night before I was traveling to a meeting in New York City, I created a custom desktop screen on the Samsung Galaxy S III specifically for the trip. On an iPhone, I would have needed to drill into a half-dozen apps to use my tickets, maps, contacts, nav routes, et cetera. On the Galaxy, all I needed to do was swipe away from my home screen. There they all were, in the form of shortcuts and widgets. Yes: on that day, customization made the Galaxy S III easier to use than the iPhone, hands-down. Google doesn’t exert as much control over Android developers as Apple does over iOS developers. This held Android back for its first few years, but in Android 4.1, developer freedom pays serious dividends. Shush! 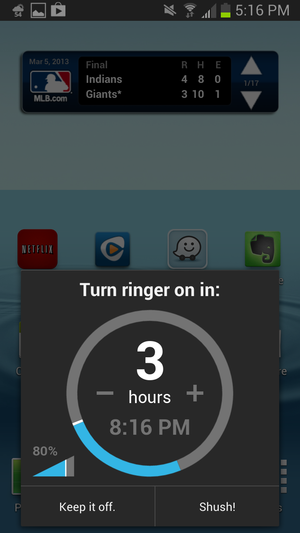 is a customization that lets you choose how long your phone remains silent. When I hold the volume-down button of my Galaxy S III, my Samsung doesn’t simply go to Mute. When the volume drains to zero, a third-party system enhancement called “Shush!” kicks in and opens a popup. It gives me the option of having the ringer return to its original volume level after a certain interval (like, when the movie’s over). In many of my Android reader apps, I can use the volume keys to turn pages, or flip between articles. It’s not the least bit confusing. The volume keys work normally within the app until I look inside the app’s Settings page and click the checkbox to activate the feature. Again: normal behavior until the user deliberately chooses to modify it. Choice, choice, choice. It’s not the opposite of Apple’s “Control, control, control.” Instead, it’s a yin-yang sort of relationship. Each concept seems to define what an iPhone and an Android phone are good at, and the kind of consumer each phone is trying to please. In a way, the wide range of Android handsets available from multiple manufacturers is another form of choice. Apple gives you one new phone. Like it or lump it. I saw the iPhone 5. I passed. The Samsung Galaxy S III isn’t the best Android phone for everyone, but it doesn’t need to be. Keep looking and you’ll find something better suited to your needs. And if you insist on having a mechanical keyboard, the Android ecosystem doesn’t attempt to judge you and your taste. Android handset makers only want your money. In part 3, I wrap up this little bagatelle. I’ll do a little mythbusting about the famous downsides about Android that are either no longer true or have become, at worst, manageable nuisances instead of dealbreakers. Why harp on long-dispatched problems when Android delivers so many actual bummers? Yes, I’ll talk about those as well. Finally, why was this series so tough to write? And do I believe that Apple has fallen behind and will soon be washed-up? Read Part Three for the answer to the first question. As for the second: hell no and heller-no. This story, "Customize and collaborate: Why I switched from iPhone to Android, Part 2" was originally published by TechHive.